Item # 309905 Stash Points: 995 (?) This is the number of points you get in The Zumiez Stash for purchasing this item. Stash points are redeemable for exclusive rewards only available to Zumiez Stash members. To redeem your points check out the rewards catalog on thestash.zumiez.com. 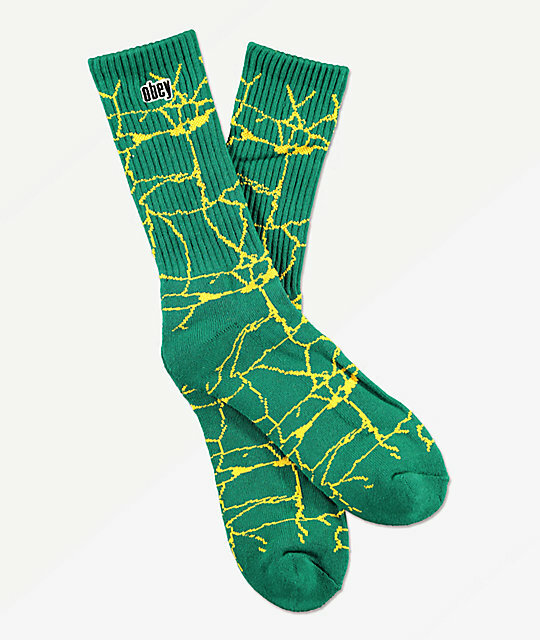 Add some fun flair to your outfit with the Concrete green crew socks from Obey. A teal sock with yellow crack graphics displayed throughout, these crew socks will make a statement with any outfit. You will also find an Obey logo embroidered on the ribbed upper for sublte branding. Concrete Green Crew Socks from Obey. Embroidered Obey logo graphic on the upper cuff. Jacquard knit cracked concrete graphic throughout.